Oh! What splendid loves I dreamed of! My only trousers had a large hole in them. With rhymes. My shelter was under the Great Bear. My stars in the sky were rustling softly. Of dew on my forehead like a fierce wine. Of my wounded shoes, a foot close to my heart. I have tried to do a translation of one of my favourite Rimbaud poems. 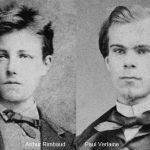 It was the first Rimbaud poem I ever read and was in the first book of French poetry I ever bought. It’s a tricky thing, translating poetry, but I enjoy doing it. I think doing this translation helped me to understand the original text a bit more, maybe. I love the opening, as the poet starts by saying “je m’en allais” — “I went off”. I’m not sure if I was right in my translation here. Because the French is in the imperfect tense, and so it’s more of a continuous action in the past… perhaps I should have written “I was wandering off”, but that made the first line too long. Anyway. There is no object to the speaker’s wanderings here; he is simply walking, with no fixed destination. I remember reading that first line over and over to myself when I first encountered the poem; I loved the familiarity of the language, and was amazed and thrilled at how accessible it was. His pockets are “crevées”, which means “torn” or “exhausted”. But Rimbaud also describes his tattered coat as “ideal”. It is ideal because it means his purity is not being tainted by vanity or money. He is walking beneath the sky, subject to the whims of his Muse. This is a very Romantic idea: that poets are almost vessels, blessed with inspiration from the Muse when it should please her to bless them. I like this idea sometimes — it kind of takes the pressure off the poet — but then I sometimes don’t like it, because it also means that when one does write something good, it’s really down to the Muse rather than your own hard work… But whatever. In the second stanza, the material poverty of the poet is evident again, because of the large hole in his only pair of trousers. I love the image of his auberge being a constellation of stars. They are his stars, he says, and they have voices. Obviously his stars are symbolic of his destiny. The speaker listens to his stars as his sits of the roadside. This all gives me a feeling of the poet being in touch with nature, with God(s), and with what his destiny might be. Nature seemingly provides him with everything he needs: the Great Bear constellation gives him shelter, he sows his rhymes along the roadside, as though his poetry could feed him, and he also talks about the dew on his forehead being like “wine”. He has no money, no possessions, but nature provides for him. The poem ends with the image of the poet plucking the elastics of his old shoes as thought they were “lyre strings”. I love this image because it’s like the poet can create music (or poetry) without wealth or status or connections or anything else you might think you would need… He’s a pure poet, “sowing the roads/ With rhymes”, just for the pleasure of it.